At first Zwingli tried to persuade them in private conferences, but in vain. Then followed a public disputation, which took place by order of the magistracy in the council hall, Jan. 17, 1525. Grebel was opposed to it, but appeared, together with Manz and Reubli. They urged the usual arguments against infant baptism, that infants cannot understand the gospel, cannot repent and exercise faith. Zwingli answered them, and appealed chiefly to circumcision and 1 Cor. 7:14, where Paul speaks of the children of Christian parents as “holy.” He afterwards published his views in a book, “On Baptism, Rebaptism, and Infant Baptism” (May 27, 1525). 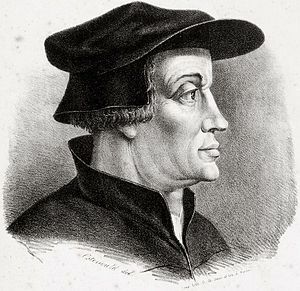 Bullinger, who was present at the disputation, reports that the Anabaptists were unable to refute Zwingli’s arguments and to maintain their ground. Another disputation was held in March, and a third in November, but with no better result. The magistracy decided against them, and issued an order that infants should be baptized as heretofore, and that parents who refuse to have their children baptized should leave the city and canton with their families and goods. The Magistrates saw this as a demonstration of an anarchic spirit and they cracked down. Hard. Indeed, they were right to. The early Anabaptists weren’t peace loving Yoder-ians. They were – for all intents and purposes – anarchists bent on overthrowing not just the Church but the State. It was the political dimension of their protests which drew Government ire and resulted in the violence leveled against them. And it all started on January 17, 1525, when they rejected persuasion and determined to have it their way no matter the consequences.